I’m a HUGE fan of this Master Mind Group: Launch and Accomplish your Dreams! Motivational Whisperers Successful Master Mind Groups are for people who want to make their dreams and goals come true. Helping countless business and entertainment professionals advance their careers to heights they didn’t think were possible. Motivational Whisperers Successful Master Mind Groups can help you too! If you are seriously ready to have your business take off then you are ready for this powerful Master Mind Group because that is exactly what will happen when you become apart of this group. View my Blog Talk, comments welcome! This email was sent by Balance & Power Inc, PO Box 894, Baldwin, NY 11510, using Express Email Marketing. You were added to this list as info@balanceandpower.com on 6/17/2011. We know that was Alfred E. Newman from “Mad Magazine” and everyone went around saying it. Worrying is like stepping on the gas pedal while the car is in neutral: we create a lot of noise, use energy and don’t go anywhere! EFT (Emotional Freedom Technique) works extraordinarily well to overcome anxiety, fear and worry. Learn more about EFT: http://www.balanceandpower.com/eft.php and my NEW! Summer Series in Baldwin for July-August and one:one trainings http://www.balanceandpower.com/events. If you have a group at your location, I will be happy to facilitate there. I’ve just returned from a wonderful EFT-ADV continuing education training in Nyack, NY, and am excited to share new techniques and reliable tried and true ones! I know that I’m a “worrier” and that EFT is miraculous! as are other techniques that I combine with Peak Performance Success Coaching in my venues. Even if you’ve had worry role models all your life, and/or a genetic predisposition towards anxiety, you can reset your M.O. and create new mind-body patterns with repetition and practice and a good teacher-coach. It’s never too late! April is National Stress Awareness Month, and do we need it! In a recent study by the American Psychological Association, 75 percent of adults reported experiencing moderate to high levels of stress in the previous month, and nearly half reported that their stress has increased in the previous year. Yet, only half of participants said that they are doing enough to manage their stress. Meditation can help. Scientific research has shown that meditation can improve your mood, boost your immune system, improve regulation of stress hormones, enhance your ability to empathize, calm anger and anxiety and help you cope with pain and depression. Unfortunately, people tend to assume meditation takes a lot of time or requires a special place. You imagine meditating in a beautiful park, or when you’re on vacation, or when you get home from work, when this big project is finished, when the kids grow up…or maybe when you retire. You imagine meditating anywhere but right here, in the middle of your stress, when you need it most. (When you’re very stressed, even the thought “I really should meditate” can be stressful; – I really “should” anything is :). So you push peacefulness farther and farther into the future and farther away from this moment, now. SOAR! 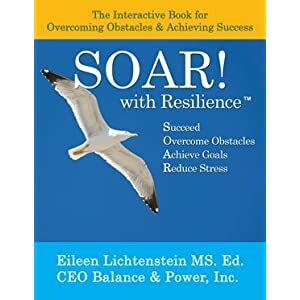 with Resilience™ Book is a wonderful resource for successful strategies to overcome stress and be happier!